September 8th, 2016 marks the 50th anniversary of International Literacy Day. Established by UNESCO in 1966, International Literacy Day reflects the desire to increase global literacy rates, promote literacy as a tool for peace and positive change, and empower individuals to achieve their dreams. 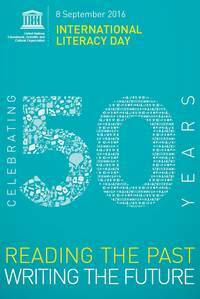 This year, UNESCO celebrates under the theme “Reading the Past, Writing the Future”, honoring the progress made toward global literacy, acknowledging current challenges, and discussing solutions that can be enacted across cultures and regions. Global literacy is incorporated into many national and intergovernmental peace-building programs, including UNESCO’s 2030 Agenda for Sustainable Development. With the key goal of wiping out poverty, the international community identified education and literacy as valuable tools in the fight against economic inequality. The Agenda specifically states, “ensur[ing] inclusive and equitable quality education and promot[ing] lifelong learning opportunities for all” is essential for true sustainable development. 2016 is the first year for 2030 Agenda implementation. What role does technology play in literacy? Even though they increase our access to information, technological advances both help and hinder global literacy. With increased access, knowledge is always at our fingertips. This shift from print to digital eliminates geographic boundaries when attempting to access educational resources– that is, if we own the types of technology that can access it (phones, computers, tablets, etc.). Due to the increase in demand for digital materials, some basic literacy tools are only accessible electronically – thereby only accessible to those with enough monetary resources to purchase the technology that can access these digitized materials. The International Federation of Library Associations (IFLA) identifies this trend in the information services realm – a trend that no doubt favors more economically developed regions. IFLA acknowledges that access to information has and will continue to have profound impact on developments in the information economy. According to the IFLA Trend Report, “An ever-expanding digital universe will bring a higher value to information literacy skills like basic reading and competence with digital tools. People who lack these skills will face barriers to inclusion in a growing range of areas. The nature of new online business models will heavily influence who can successfully own, profit from, share, or access information in the future.” Working with other interested organizations and individuals, this organization moved for the inclusion of these concepts in UNESCO’s Agenda. Boughton, B. & Durnan, D. 2014. “Cuba’s ‘Yes, I Can’ mass adult literacy campaign model in Timor-Leste and Aboriginal Australia: A comparative study.” International Review of Education 60, no. 4: 559-580. Duncan, Lynne G., Sarah P. McGeown, Yvonne M. Griffiths, Susan E. Stothard, and Anna Dobai. 2016. “Adolescent reading skill and engagement with digital and traditional literacies as predictors of reading comprehension.” British Journal Of Psychology 107, no. 2: 209-238. Hanemann, Ulrike. 2015. “Lifelong literacy: Some trends and issues in conceptualising and operationalising literacy from a lifelong learning perspective.” International Review Of Education / Internationale Zeitschrift Für Erziehungswissenschaft 61, no. 3: 295-326. Sharma, Ravi, Arul-Raj Fantin, Navin Prabhu, Chong Guan, and Ambica Dattakumar. 2016. “Digital literacy and knowledge societies: A grounded theory investigation of sustainable development.” Telecommunications Policy 40, no. 7: 628-643. Sharp, Laurie A. 2014. “Literacy in the Digital Age.” Language And Literacy Spectrum 24, 74-85. De Abreu, Belinha S. & Yildiz, Melda N. (eds.). 2016. Global media literacy in a digital age: teaching beyond borders. New York, NY: Peter Lang. Erstad, Ola & Sefton-Green, Julian (eds.). 2013. Identity, community, and learning lives in the digital age. New York, NY: Cambridge University Press. Rowsell, Jennifer. 2013. Working with multimodality: rethinking literacy in a digital age. London: Routledge. Tyner, Kathleen R. 1998. Literacy in a digital world: teaching and learning in the age of information. Mahwah, NJ: L. Erlbaum Associates. Welsh, Teresa S. & Wright, Melissa S. 2010. Information literacy in the digital age: an evidence-based approach. Oxford, U.K: Chandos. Climate change is an issue that, perhaps more than any other, exemplifies the complexity of intergovernmental cooperation and international policymaking. For decades, climate change has been debated and discussed in the forum of international politics, most notably since the United Nations Framework Convention on Climate Change (UNFCCC) was negotiated in 1992. The Intergovernmental Panel on Climate Change (IPCC), established in 1988, produces reports on the status of climate change based on the latest in peer-reviewed scientific literature on the topic. Since its inception, the IPCC has published four major reports on the status of climate change, each of which have been heavily relied upon by policymakers worldwide in creating environmental policy at the national and international levels. This week, the IPCC released Working Group I of the Fifth Assessment Report (Working groups II, III, and the Final Synthesis Report will be released in 2014.) The report states that it is “extremely likely” that human activities have been a contributing factor to climate change in the last 60 years. This shows an increase in certainty of human involvement in climate change since the IPCC’s last report in 2007. The report provides projections of future climate change, with four scenarios of future greenhouse gas emissions. It also provides a peak “target” level of greenhouse gas emissions, at which climate changes will become irreversible. Since becoming a topic of international discussion, as well as grounds for national and international environmental policy, the science of climate change has often been mired in public skepticism. The IPCC itself came under attack by skeptics in 2009, when thousands of emails between IPCC scientists were leaked to the public. Critics claimed that the emails showed negligence and even deliberate tampering of climate data. While eight independent committees found no evidence of fraud or scientific misconduct in the emails, public distrust of climate science remains an issue and influences environmental policy. Nevertheless, international leaders are certain to draw upon the findings of the IPCC’s Fifth Assessment Report in negotiating a new treaty to reduce emissions. Ban Ki-moon, the United Nations Secretary General, plans to assemble a panel of world leaders in 2014 to negotiate just such a treaty, and once again the world will watch as climate change becomes a forum for international debate and policymaking. Boasson, Elin Lerum; Wettestad, Jørgen. (2013) EU Climate Policy: industry, policy interaction and external environment. Farnham, Surrey, England : Ashgate. Kellow, Aynsley J.Boehmer-Christiansen, Sonja. (Eds.) (2010) The international politics of climate change. Cheltenham, UK : Edward Elgar. Osofsky, Hari M.; McAllister, Lesley K. (2012) Climate change law and policy. New York : Wolters Kluwer. Wang, Weiguang; Zheng, Guoguang; Pan, Jiahua. (Eds.) (2012) China’s climate change policies. Milton Park, Abingdon, Oxon ; Routledge. Andonova, L. B., Betsill, M. M., & Bulkeley, H. (2009). Transnational Climate Governance. Global Environmental Politics, 9(2), 52-73. Compston, H. (2010). The Politics of Climate Policy: Strategic Options for National Governments. Political Quarterly, 81(1), 107-115. Davidson, S. (2010). Climategate hits the IPCC. Institute Of Public Affairs Review, 62(1), 26-28. Ravindranath, N. H. (2010). IPCC: accomplishments, controversies and challenges. Current Science, 99(1), 26-35. Zajko, M. (2011). The Shifting Politics of Climate Science. Society, 48(6), 457-461.